The Sea-Dweller reference 1665 is like wearing a story on your wrist… a story of innovation and of a watch company in Switzerland who worked with a diving company from France (Comex) whose saturation diving bell divers had a specific need, and how the two companies worked together to give these aquatic astronauts what they needed to perform their job. It’s a cool story and a very cool watch. 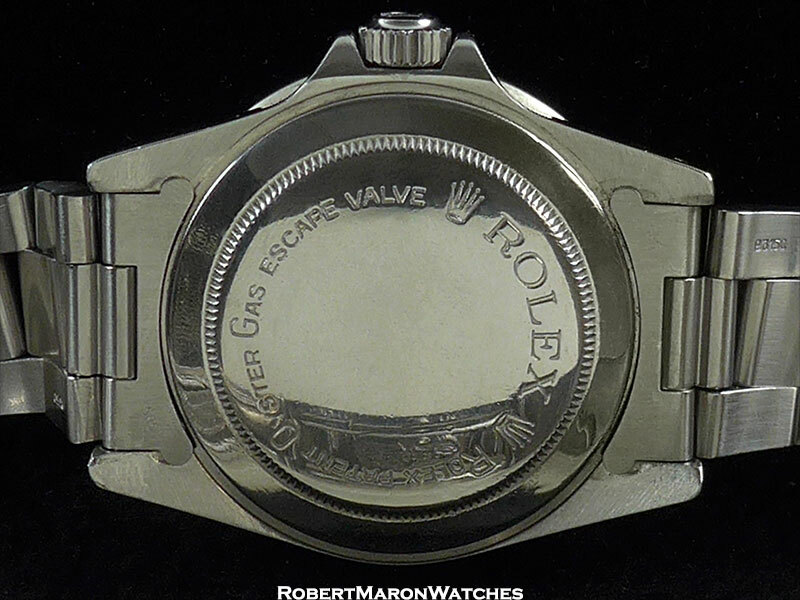 Original stainless steel case has dimensions of 40mm diameter by a massively thick 16.5mm thick. Fantastic “ghost” bezel because its color has organically faded to a uniform and pleasing gray from the original black color. Generously domed acrylic crystal, count-down bezel which is revolving smoothly with just the right amount of resistance, perfectly operating screw down Trip-Lock crown and the innovation that defines the Sea-Dweller, the helium escape valve in the case side at the 9 o’clock position. Serial number 5387XXX dates watch to 1977. Movement is the automatic winding Rolex Caliber 1570 which is a 26 jewel C.O.S.C. Certified Chronometer. Movement is clean and running. This movement provides a date function, which is displayed at the 3 o’clock position. Given that this is a bonafide tool watch, the watch has to be able to perform in its intended environment (extremely heavy and widely ranging atmospheric pressures) and provide its wearer with a simple time display that can be read at a glance. Rolex succeeded. 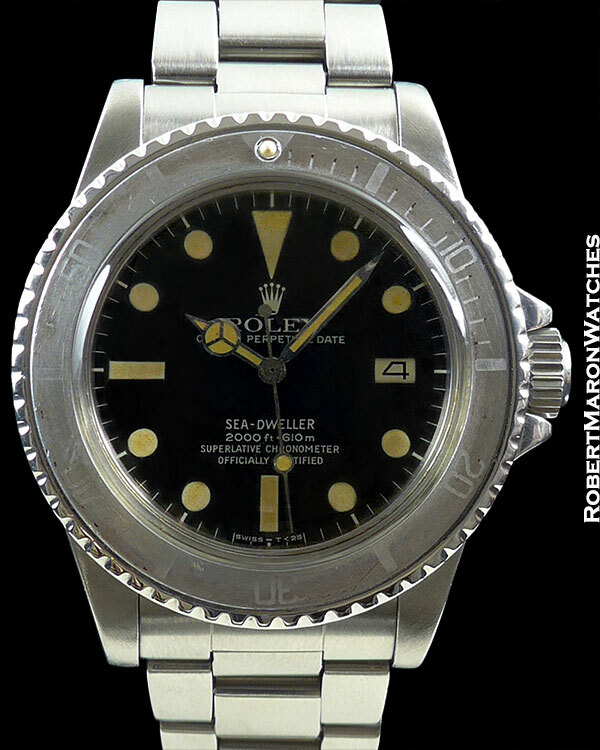 The 1665 Sea-Dweller dial is black with oversized luminous hour markers. The cardinal positions have a different marker from the others, with the 12 o’clock position using an upside down arrow, the 3 o’clock position has the date window, the 6 o’clock and 9 o’clock positions have a bar. A diver might be operating in total darkness, performing a series of tasks with his arm, and being able to read the time with no other orientation to your watch than the glowing hour markers, is key. This dial offers simplicity, legibility and logic and to collectors, of course, great beauty. This dial is in perfect condition with nice even patina on the markers which no longer glow, relumed original hands and date at 3 o’clock. As the dial attests, this watch is built to be water resistant to 2000 feet. 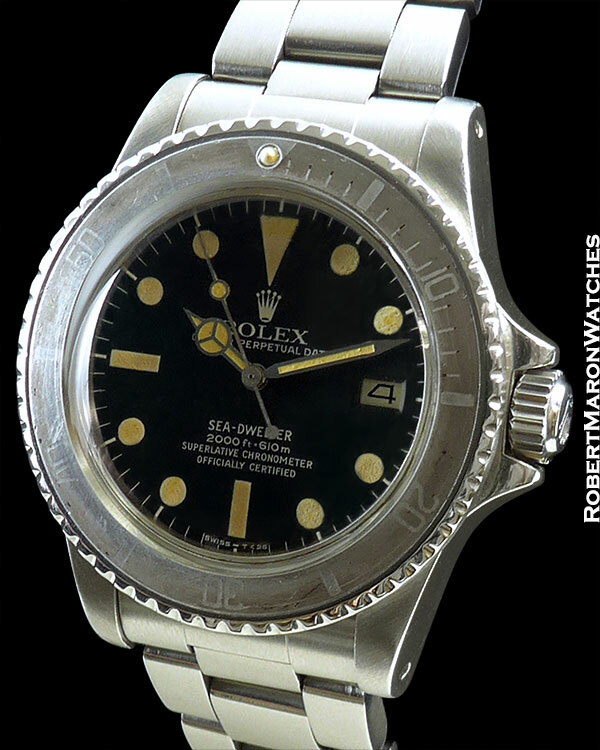 Bracelet is Rolex 93150 Oyster with mild to medium stretch and flip-lock clasp along with inner diver’s extension. This is a really nice ‘Dweller and will serve for decades to come as a wonderful daily watch.